To train or not to train when sick: does exercise boost immunity? Cold and flu season has arrived. When you’re feeling under the weather, is it best to train or not to train? What does the research say? Scientists have been looking at this issue for many years and some good information has come from their research. In one study of mice, one group ran to exhaustion three days in a row, the other group was completely sedentary. After both groups were exposed to the flu virus, more of the exhaustive exercisers got sick than the sedentary group. In another experiment, there were three groups of mice that were exposed to the flu virus. One group rested, the other group exercised moderately (easy jogging for 20-30 minutes), and the third group ran hard for two and a half hours. The flu bug used in this experiment is deadly to rodents. They all repeated their routines for 3 days and flu symptoms then started to appear. The results showed 50% in the sedentary group and 70% in the exhaustive exercise group passed away. But, of the moderately exercising group, only 12% got sick! Light or moderate exercise is best when sick. Over the years, doctors and scientists have concluded that light or moderate, consistent exercise decreases your risk of catching flu or cold and symptoms will be milder if you do get sick. If you exercise intensely for a prolonged period of time, your risk of getting sick jumps right up. (General definition of intense exercise is a workout or race of one hour or more with elevated heart rate and respiration, i.e. feels like prolonged hard work.) Intense workouts and racing suppress the body’s immune response for a period of time after exercise. 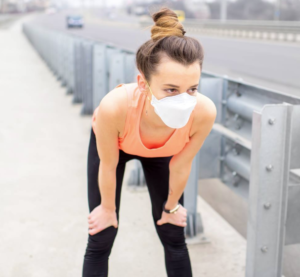 What happens to your immune system under moderate exercise and exposure to illness? Under attack by a virus, the immune system increases T1-type helper immune cells. These T1-helper cells induce inflammation and other changes in the body that represents the first line of defense against an invading virus. But if the inflammation, at first so helpful, continues for too long, it becomes counterproductive. The immune system needs, at some point, to lessen the amount of T1-mediated inflammatory response so that, in fighting the virus, it doesn’t accidentally harm its own host (your body!). The immune system does this by gradually increasing the amount of another kind of immune cell, T2-helper cells, which produce mostly an anti-inflammatory immune response. They’re water to the T1 fire. The balance between the T1- and T2-helper cells must be exquisitely calibrated. The mice who exercised moderately subtly hastened the shift from a T1 response to a T2-style immune response, just enough to have a positive impact against the virus. Moderate exercise suppresses TH1 a little and increases TH2 a little. On the other hand, long hard workouts may suppress TH1 too much. That first line of defense may shut down before it has completed its work that could lead to increased susceptibility to viral infection. Above or below the neck. If you really don’t feel well, especially if you have a fever, body aches and deep chest cough, avoid exercise until you’re feeling better. If you have a simple head cold, light exercise can actually improve the way you feel. One rule to follow is that if the sickness is above the neck, ok to do some light exercise. If it hits below the neck, chest congestion, body aches, etc., rest until the symptoms are gone. Keep moving, hard when you’re feeling good; dial it down when you’re not feeling so good.